Thank you for your interest in Mount Auburn Cemetery. Please use the list below to best direct your inquiries and an appropriate member of the staff will respond to your request. If you are unsure about where to direct your inquiry, please use the general information contact. Please see our Film and Photography Guidelines for additional information, or fill out our Application for Filming and Photography at Mount Auburn. When I was walking in the cemetery yesterday, I visited the Japanese Maple that I have funded in memory of my beloved late husband, William G. DeLana 1933-1987. It is at the intersection of Magnolia and Swan. I noticed that the label seemed askew, and when I looked closely, I could see that the bottom screw appeared to have broken off in the trunk. May I please ask that a new screw replace the one that seems to have broken off? Thank you very much. We will take care of it right away. Thank you for bringing this to our attention. I am interested in knowing whether or not you have a Slide Presentation, which could be presented to a DAR meeting in May 2013. Hi Nancy, Thank you for your comment. We have emailed you with the name of the appropriate contact. Hi James, Thank you for your inquiry. We have sent you a response to the email address provided with your comment. I am looking forward to visiting your cemetery. Do you have a list of graves in the Trinity Church section? I understand that the original graves from Trinity were relocated to your cemetery. Thank you for the inquiry. Mount Auburn does have a lot where some of the parishioners of Trinity Church are now buried. If you are planning a visit, please stop in at our Visitors Center and we would be happy to mark the exact location on a map for you. I am passing through Cambridge on Tuesday June 26, and like to know whether Elizabeth M. Stelle nee Sheffield (1875-1961) is buried there. Her brother Alfred Dwight Sheffield was buried at Mount Auburn, after he also died in 1961. Not sure if the siblings were laid to rest in the same cemetery. Please send confirmation and directions for Elizabeth’s grave to my email as soon as possible. Thank you for your comment. Information has been sent to the email provided in your comment. When you’re on on our website (on any page), you’ll notice several options in the upper right hand corner of the screen. Click on the ‘Map’ option. This will take you to our interactive map where you can input the name of the individual you’re looking for along with approximate date of death. Once you click ‘Submit,’ the map will pull up all matches. Best of luck in your genealogical search, and if you have difficulty, please contact the Friends of Mount Auburn at friends@mountauburn.org. Hello Ken, We have sent an email to the address affiliated with your comment with information. Thank you. need to locate graves of iasigi family. Hello, Location of Burial is free of charge, but you must complete the form in our web store. You can also use our interactive map: simply enter the family name and approximate date of death. Best of luck in your research. I read somewhere that I can have a one hour free consultation with a genealogical expert at the Cemetery. i will be staying on Lexington Ave. in Cambridge all this week (Sept. 17-25) and would like to so this. 1)Where is the marble plaque that used to hang on our family’s monument (The Emmons monument on Alder Path)?. Who has it and why was it removed? 2)Who are the people (12, I believe) who are buried in our vault? 3)When was the wrought iron fence removed, and why. How much would it cost to restore it. 4)Where is by grandmother (Marie DePont Emmons) buried? Her name is on the monument but she has no grave marker. Hello Ann, We have forwarded your request to our Historical Collections department. A member of our staff will contact you in the next few days. Looking to find where certain members are buried in Mt. Auburn. What Info would u need from me? Hi Rosalie, you can search for a grave location right on our website! I was there last week and noticed that my Grandmother’s grave did not have grass growing. It needs SHADED grass seed in order to grow, as the tree prevents the grass for growing. The Last name is PRATO, Mary, Salvatore, and Domenic. Please rectify This situation. Someone from our grass crew will be in touch with you shortly. Thoroughly enjoyed Wednesday’s presentation at the greenhouse. Very knowledgeable leader and wonderful short walk! We are so pleased that you enjoyed your visit! The monument that you refer to may be the Spike family lot on Spruce Avenue here at the Cemetery. According to volunteers, the lot may date from the late 1950s. I never realized this cemetery had such an agricultural, architectural and historical significance. I am amazed at what I am reading online and seeing in pictures. There will most definitely be a visit for me in the future. Can you please tell me if you have an online map of grave stones? If not can you tell me where Phillips Brooks grave is so that I can visit it? Hi Susan, There is an online grave locator found here: http://mountauburn.org/map/. Phillips Brooks is one of the notable residents marked on our Visitor Map which can be purchased when you visit at the front entrance gate for $1. You will find that he is buried on Mimosa Path. Enjoy your visit! Hi my name is Bijan Rosen and I am a highschool student at CRLS. I am working on a project to plant more trees for the city of Cambridge and I was hoping I could get the contact information of somebody who works with/is involved with the trees at the cemetery. Thank you. The ornamental cherry near the entrance has dead leaves and dying leaves in sections of the tree just as the one in our yard (and others I’ve seen around town). How are your horticulturists handling this? A tree company told me to keep cutting these areas but soon there won’t be any tree left. Should I assume the tree is going to die? My wife and son and went for a walk around lunch time today and saw a coyote! Happy New Year KZ and family! We are happy that you enjoy walking at Mount Auburn Cemetery. Seems the Cemetery closes at 5, which now is just before the Owls start their hunting. I seem to recall the hours being opened last year until 6 for at least part of the year. Is there a switch? Our security team sets the hours for the Cemetery and they usually set them in accordance with daylight savings time. After March 12th you will probably see the hours extended to 6PM. 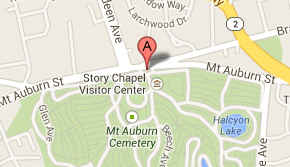 We plan on visiting this Sunday, is the Visitors Center in Story Chapel open that day? Yes Sal! Our Visitors Center will be open 9-4:30 this Sunday. Hi, just wondering if the cemetery and tower are open this Monday on Labor Day and what the hours are? Hi Shannon, Thank you for your interest in Mount Auburn Cemetery! We will indeed be open on Monday. The office will be closed, but the grounds are open until 8PM and the Tower until 6PM. I just wanted to acknowledge the kind efforts and disposition of your volunteer, Ginny, at the visitors center during our visit on September 1st. She was so helpful and genuinely inviting. It set the foundation for a wonderful day. Her graciousness combined with beautiful weather, made for a relaxing afternoon. It was our first time visiting, but it won’t be our last. Thank You. Thank you Pamela! We are so glad that you had a nice visit and we all agree with you about Ginny – she is terrific! I recently took a walk for the first time around Mt. Auburn and loved the beautiful grounds and peaceful atmosphere. I would like to know more about the volunteer opportunities at Mt Auburn. 9/24/17 There are three beautiful ducks currently living/feeding in Willow Pond (for about the last 10 days or so). What are they? I have heard that Mount Auburn started the movement for urban parks. Can you tell me who first wrote about this? Could you please provide me with an email where I can send my resume and cover letter for the GIS Specialist position that you have open? To apply for a job at Mount Auburn Cemetery, please submit a cover letter and resume, as MS Word documents, by email to jobs@mountauburn.org stating the job title in the subject line. You can also mail a cover letter and resume to Mount Auburn Cemetery, 580 Mount Auburn Street, Cambridge, MA 02138, Attention: Human Resources. No telephone calls please. Is “Sweet Auburn Magazine” available in a hard copy, or digital only? Thank you. Hello Jarrod, Thank you for your interest in Mount Auburn Cemetery! Sweet Auburn Magazine is printed twice a year and is mailed to members of the Friends of Mount Auburn Cemetery and it is also available on the racks here at the Cemetery when you visit.